When bluestocking Vivian Loren becomes the governess for the wealthy Spencer family, she’s hunting for clues about the murder of her brother, not romance. But Vivian didn’t count on one thing: James Spencer, the infuriatingly handsome Duke of Abermont. As head of Britain’s elite intelligence agency, James has no time to find and woo a wife. After discovering Vivian’s quest for answers has made her a pawn in a treacherous plot of one of Napoleon’s most deadly spies, James realizes they can help each other. She’ll become his duchess, and he’ll keep her safe. What begins as a marriage of convenience quickly becomes anything but as secrets surface. Love may be the most dangerous mission of all. Covert Heiresses is the adventurous new historical romantic suspense series from USA Today Bestselling Author Erica Monroe, featuring four scandalous women who are England’s top spies. #1 in the “Covert Heiresses” series and what a beginning. Simply WOW! Intriguing, passionate, and simply mesmerizing! Well written with engaging, and wickedly delightful characters. True, some was devious and evil, but nonetheless entertaining. Filled with intrigue, danger, spies, loss,grief, secrets, passion, engaging characters, to say the least and of course romance, passion and finally finding love amongst grief and angst. I was not disappointed in any any way in Ms. Monroe’s story,once again, she has written a story with such passion as to keep the reader mesmerized. I truly look forward to the next dangerous installment. Feisty, dangerous and courageous females makes this a not to miss series. 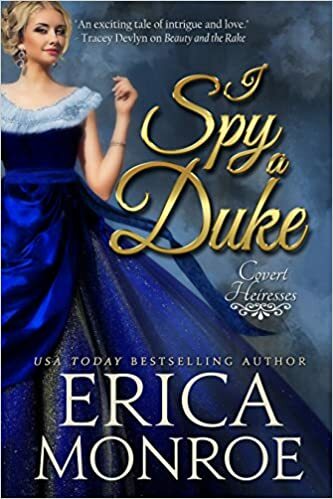 Fans of Historical Romance, spies, feisty females, heroic males,dangerous situations and a wickedly seductive tale will enjoy “I Spy a Duke”. A most dangerous tale. Highly recommended! !